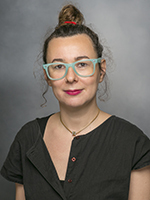 Monika Izano, PhD, is a Postdoctoral Research Fellow at the Kaiser Permanente Northern California Division of Research. Dr. Izano’s research focuses on the application of statistical methods for the estimation of causal effects in observational studies. At the Division of Research she researches fracture outcomes among older women receiving osteoporosis treatment. She holds a concurrent appointment as a Postdoctoral Scholar in the Program in Reproductive Health and the Environment at the University of California, San Francisco, where she researches the effects of environmental and psychosocial exposures during pregnancy on birth outcomes. Prior to coming to the Division of Research, Dr. Izano completed her doctoral training in epidemiology at the University of California, Berkeley. Her dissertation work examined the causal relationship between occupational exposures and cancer incidence as well as causal estimation approaches in the presence of time-varying confounding and left-filtering, two potential sources of bias in survival analyses. She also holds a Master of Arts in biostatistics from the University of California, Berkeley, a Master of Sciences in epidemiology from the Harvard T.H. Chan School of Public Health, and Bachelor’s degrees in mathematics and computer science from Brandeis University. The Healthy Worker Survivor Effect: Target Parameters and Target Populations. Current environmental health reports. 2017 09 ;4(3):364-372. Epub --. Contrasting Causal Effects of Workplace Interventions. Epidemiology (Cambridge, Mass.). 2018 07 ;29(4):542-546. Epub --. Diet Quality of Breast Cancer Survivors after a Six-Month Weight Management Intervention: Improvements and Association with Weight Loss. Nutrition and cancer. 2013 Oct 10;68(8):1301-1308. Epub 2016-09-16.
International journal of cancer. 2016 Mar 01;138(5):1118-28. Epub 2015-10-19. Cancer medicine. 2015 Feb 01;4(2):315-24. Epub 2014-12-16. BMJ open. 2013 Oct 10;3(10):e003232. Epub 2013-10-10.